A type of athletic shirt made of spandex and nylon or polyester. Rash guards may be worn as an alternative to wetsuits during warmer weather. They may also offer UV protection. Wetsuits and drysuits are insulated, close fitting suits designed for prolonged immersion, usually in the context of snorkeling, scuba diving, or surfing, and other water boardsports. Made from neoprene, they come in different thicknesses and styles depending on the user's interests. Wetsuits keep the wearer warm by trapping a thin layer of water close to the skin which heats up due to body temperature. Swimsuits made of technologically advanced fabrics biomimetically designed with a surface that mimics the rough shark denticles to reduce drag along key areas of the body. The characteristics of the fabric improve shape retention and increase muscle compression to reduce vibration and retain muscle shape to reduce fatigue and power loss. Available in a variety of cuts such as bodyskin, legskin, high cut swim briefs, and kneeskin. Probably the most common form of swimsuit, this is the inspiration for the tank top as a mainstream article of clothing. The name "tank suit" is also supposed to be derived from the term "swimming tank", an obsolete term for what is now called a swimming pool. One piece covers the breasts and stomach (like a tank top), the other the crotch and buttocks. Leaves a small gap in between the belly button and the hips, available in stylistic variations. Covers the whole body and head (but not face) in a manner similar to a diver's wetsuit. Swim briefs, often made of wool and held in place with a military-style canvas belt at the waist, go back at least to the 1930s. They can be seen in hundreds of print ads, worn by muscleman Charles Atlas, and were very popular. Although in a style that today appears similar to underwear briefs, it is likely that the swimwear preceded the underwear, A nylon version (without the belt), pictured at left, was launched at the 1956 Melbourne Olympics by Speedo. Swim briefs are now often made of a nylon and spandex composite, while some longer lasting suits are made from polyester. The style varies from a full seat to thong or g-string. Most swim briefs have a beige or white lining on the inside front made of a similar fabric. Boardshorts are a longer version of trunks that come to or past the knee. They usually have a non-elastic waistband, and will give a tight fit around the torso. Boardshorts were originally developed for various "board sports" such as surfing, paddleboarding, Wakeboarding. The looser fitting design provided less material that could catch as one mounted their board. In the US, this describes a loose, mid-thigh style of swimwear, made of 100% polyester or 100% nylon fabric. They are usually shorter than boardshorts but longer than boxer shorts. They feature a polyester liner inside the shorts. Although trunks have been used as swimwear since the 1940s, their heyday was in 1990s when they were highly popularised thanks in part to TV shows like Baywatch. Today, they have been eclipsed by boardshorts among teenagers and young adults. They remain the norm with older age groups and young children. A swimwear style similar to swim briefs, but with a more conservative cut. They can be compared to boxer briefs but with nylon/spandex composite or polyester fabric. A type of men's swimwear worn primarily by competitive athletes, somewhat resembling cycling shorts or compression shorts. Most swimsuits in western culture leave at least the head, shoulders, arms, and lower part of the leg (below the knee) exposed. Women's swimsuits generally cover at least the areola and bottom half of the breasts. ^ Sydelle, John. "The Swimsuit Industry". The Houston Chronicle. Archived from the original on October 19, 2013. Retrieved August 29, 2013. 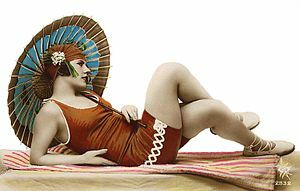 ^ "Vintage Swimwear Timeline". Glamoursurf.com. Archived from the original on October 19, 2013. Retrieved August 29, 2013. ^ "History of the Bikini". Carnival. Archived from the original on 2017-06-26. ^ Hawley, Caroline (2000-09-05). "Warm welcome for 'Sharia swimsuit'". BBC News. Archived from the original on 2009-02-17. Retrieved 2009-01-10. ^ "Speedo fastskin fsii, Speedo Fastskin PRO". swimming-faster.com. Archived from the original on 2015-12-26. ^ Administrator. "Fédération Internationale de Natation – fina.org – FINA GENERAL CONGRESS". fina.org. Archived from the original on 2015-09-23. ^ "Child Safety: Public Swimming Pool". Essortment. 16 May 1986. Archived from the original on 30 July 2012. ^ "Hot Tub Rash - Hygiene-related Diseases - Hygiene - Healthy Water - CDC". cdc.gov. Archived from the original on 2017-08-30. ^ Smollett, Tobias George (1906). The Expedition of Humphry Clinker. New York: The Century Company. pp. 38–39. ^ "Bathing - Jane Austen at the seaside". jasa.net.au. Archived from the original on 14 May 2013. ^ "Vanities". .assumption.edu. Archived from the original on 2013-05-30. Retrieved 2013-06-15. ^ Meagan Hess. 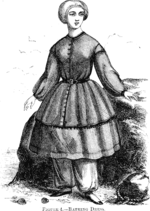 "Skirting the Skirts at the Bathing Beach". Xroads.virginia.edu. Archived from the original on 2013-06-19. Retrieved 2013-06-15. ^ "El Paso, Texas, swimming pool rules Rules for swimmers. See rule 1" (PDF). elpasotexas.gov. Archived from the original (PDF) on 2012-04-25.